I have been branching out to other bloggers as a guest poster. 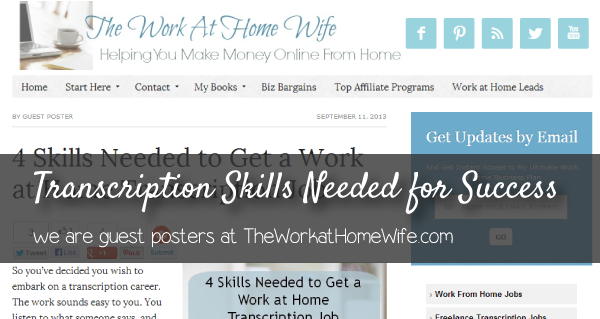 I have been honored to appear at The Work at Home Wife blog where I discussed the skills needed, and often overlooked, to land a work at home job in transcription. Many of the WAH job seekers are interested in transcription work- which is viable and a great way to make an online income. However, it is also a highly misunderstood line of work. Generally transcription work is thought of as being a simple task that can be done with ease while the kids are busy around the house. The truth however is very different. Read the 4 Skills needed to be successful as a Work at Home Transcriptionist. A Review of Transcription for Everyone (TFE): Is TFE Legitimate? You’re such a great writer Miranda! Thanks for sharing this post. Transcription can be a great work at home job and I think that you did a great job explaining some of the misconceptions about it. Thanks! Great post Miranda – I never thought of research skills as being a skill needed for transcription, but you’re right – though I don’t have to do it often, sometimes I will have to look up the proper spelling of a medical term or medication when I’m doing medical transcription.